Unveiled back at MWC 2018, the Panasonic Toughpad FZ-M1 is now available in Europe starting at the equivalent of over US$2,500 (without taxes). The highlights of this rugged Windows 10 Pro tablet with a fanless design include a sunlight readable display, FLIR and 3D imaging, and many hardware options to choose from. Although Panasonic is not in a hurry to release new tablets or to update the existing models, they surely manufacture slates that are built to last. Sadly, the Toughpad lineup is not for anyone, since it consists of extremely durable tablets for various professionals that come with pretty high prices. The Panasonic Toughpad FZ-M1 has been around for a while, but now the latest model — which features an Intel RealSense 3D camera — is finally up for sale in Europe. This rugged Windows 10 Pro slate was introduced back at MWC 2018, in the last days of February. Although not specified in the press release, we know that the hardware specs of the base model that was announced with a price tag of US$2,749 include the Intel Core m5 6Y57 processor, 8 GB RAM, and a 256 GB SSD, so the new model that has just been introduced in Europe is probably similar. Obviously, the most attractive parts of this slate are the non-standard specs and features. 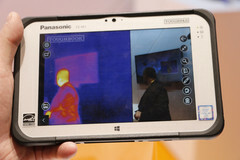 In addition to the FLIR thermal imaging camera with a thermal resolution of 160 x 120 pixels and the ability to measure temperatures between -20 and 400 Celsius (-4 to 752 Fahrenheit), the updated Toughpad FZ-M1 also features an Intel RealSense 3D camera that allows it to perform accurate 3D box measurements. Its rugged design allows for drops from up to 71 inches, also providing protection from water jets and dust (IP65 rating). The Panasonic Toughpad FZ-M1 has an autonomy of 9 hours that can be extended to 20 hours, supporting hot swap. In Europe, its price starts at €2,044 EUR (plus VAT). Those who want to take it for a spin can find the Toughpad FZ-M1 at the Hannover Messe trade show, which will close its doors on April 27.